Matt Koch works both cow horse prospects and seasoned show horses in open pastures, using the new environment to break up the routine of arena work. Although not ideal footing, open pastures can set up cow horses for success in the show pen. 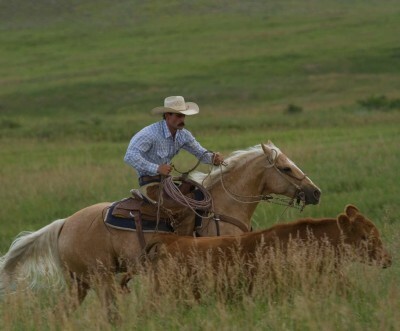 Wyoming trainer Matt Koch shares four benefits to riding outside the arena. There’s a good reason why reined cow horse events aren’t held in open pastures. Grass offers poor traction, and it hides rocks, holes and little humps in the ground. And without an arena wall, there is no way to box a cow or turn it on the fence. Nevertheless, Matt Koch loves training his cow horses outside once in a while, working on reining maneuvers, cutting and circling cows in the vast alfalfa field below his indoor arena and large outdoor roundpen. 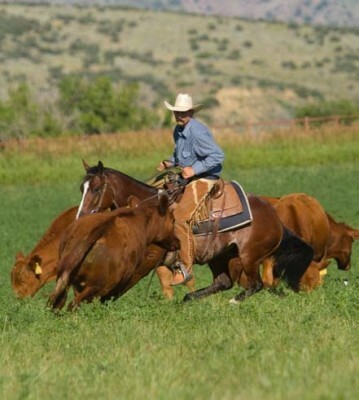 As head trainer for Wagonhound Land & Livestock, located south of Douglas, Wyoming, he trains and shows the ranch’s performance horses in National Reined Cow Horse Association shows, as well as various ranch horse events. He also starts 2-year-olds for the ranch. Koch’s cowboying background helps him appreciate opportunities to venture outside manicured dirt arenas—whether starting 2-year-olds or training show horses—and perform regular ranch work. Sometimes he and his assistant trainers help the Wagonhound crew with cattle work, and they don’t hesitate to saddle up the top futurity prospects. “We just go use them,” Koch says. “We don’t even pretend to be training. If we’ve got to go help hold herd or put together a bunch of cows, I’m not a horse trainer that day. And that seems to be the best thing for those horses. They don’t have to worry about me picking on them; just go perform a job.” Wagonhound futurity prospects spend most of their time in the arena, learning to stop, spin, rate cows, make turns on the fence and execute other maneuvers necessary for reined cow horse competition. Ranch work is a nice break from that grind. 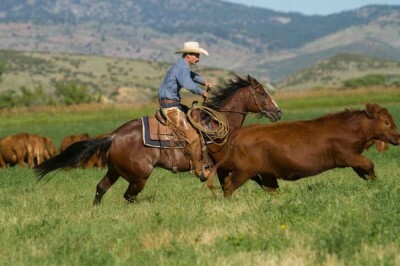 In addition to helping the cowboy crew, Koch sets up occasional training sessions in the pasture. “It’s helping their minds,” he says. “Last week I spent three days working on reining down in the hay meadow. I put them in a hackamore and had them change leads, turn around and lope big long lines. We don’t do that often—maybe once a month. But I think they’ve got to have some variety—at least for my program—to help them stay mentally sound. Outside, horses gain a fresh perspective, learn to handle imperfect footing, sharpen their cow senses and become well-rounded individuals. When stopping and turning on grass, horses learn to use their front end for better traction. To be competitive today, reined cow horses must display a high level of finesse, grit and cow smarts in the show pen. It’s easy to put too much pressure on futurity prospects, both physically and mentally. Koch believes that working in a different setting is one way to give horses a fresh perspective and offer a welcome change in routine. Working in a large area lessens the pressure because maneuvers don’t have to be executed with as much immediacy. The horse doesn’t have to make a move before the arena wall redirects the cow and spoils a training opportunity. Koch adds that working outside also helps horses focus on their job, although in a roundabout way. “It’s bred into horses nowadays to think so much—to react to every little motion a cow makes,” he says. “So they’re going to see all kinds of stuff outside. We’ve had horses we’ve shown that are good in the arena, but you take them outside and they’re real ‘looky.’ They have a hard time focusing. Koch says that imperfect ground makes a horse more sure-footed, and that helps in the show pen. 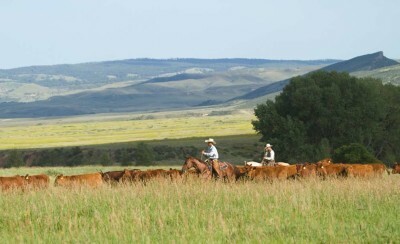 meadows, areas that Matt Koch utilizes to prepare his cow horses for the show pen. When chasing a cow across a grassy, possibly slippery pasture, a horse also learns to keep its shoulders square and move in a balanced frame. “Circling a cow outside on the grass teaches them that they can’t lean,” Koch says. “Because if they lean, they might slip and fall down in the grass. Before long they just learn on their own to keep their shoulders up and use their whole body. Horses that are used to working in soft arena dirt aren’t afraid to drop their hocks and drive their hind legs into the ground. But that’s not ideal on slippery grass, so Koch doesn’t ask for dramatic stops. Still, his horses have to learn to adjust. “I’m not asking them to run and hit the stop as hard as they can,” he says. The outside world offers plenty of distractions—wildlife, new smells, and strange shapes and shadows in the distance. But by working in such an environment, horses eventually stop focusing on diversions and bear down on their job of working a cow. And in an open pasture, cows behave differently. They may have more life or become less frantic, depending on the circumstances. Without an arena wall to guide them, they run in crooked, unpredictable directions. Regardless, the horse must pay close attention and read the cow’s next move. In open spaces, horses must closely read cattle, which run in unpredictable directions and behave differently than in an arena. Koch ropes with most of his cow horses, whether outside or in the arena. Not only does it prepare the horse for an alternate career, but it also encourages the horse to read the cow and listen to the rider. Koch says that if a horse only turns, stops or circles a cow, then he begins to charge to the cow’s head every time. Roping teaches the horse to rate the cow from behind, stepping past the cow only if the rider asks. Finally, Koch believes that exposing horses to new environments and all sorts of tasks— whether roping, performing ranch work or circling cows in an open pasture—builds their confidence. Koch says a confident horse makes a competitive cow horse. MATT KOCH was raised in Seneca, Kansas. He grew up around horses and cattle, but his education as a horseman began at Lamar Community College in Colorado. From there, he worked for cutting horse trainer Lloyd Cox, went out on his own, then landed a job with cow horse trainer Robbie Boyce. After several years training horses for Haythorn Land & Cattle Co., he became head trainer for Wagonhound Land & Livestock Co.
world championship in senior working cow horse last year. This year, they finished fourth in the National Reined Cow Horse Association’s World’s Greatest Horseman contest. In April, Koch won the reserve title at the NRCHA Stakes on Dual With A Shiner. Overall, he has won more than $310,000 in competition. He and his wife, Brianna, live on the Wagonhound, located south of Douglas, Wyoming. For complete Western Horseman article click here.